Stand in natural position, as in exercises described before, keeping similar feeling of elastic force, but now imagine that you are standing in water up to your chest level (or between chest and stomach). Imagine that there is a wooden board floating on surface of water. Put your palms and forearms on this board. Imagine that no effort is needed to keep this position, because your arms are supported by the board floating on water. This way it will be easier to remove excessive tension. Shoulders should be relaxed as much as possible, elbows sinking and pointing outward at the same time. Your armpits half open, as if you kept some small balls or balloons under them. Try to keep the feeling of elastic strength everywhere, as in previous exercises, at the same time trying to keep the state of relax and comfort. Mind calm, focused on body, but not detached from surrounding environment. Breath is flowing freely. When you feel that you made some progress with the most basic exercises, you can try to make next step. This kind of practice is known as mo li or mo jin - feeling force. Imagine that masses of water which are behind you are pushing your body forward. At the same time imagine that masses of water which are in front of you, create some resistance, trying to stop your body movement. At this time don't think that it is your force, or that you are resisting (this way it will be easier to avoid too much tension). Keep relax, but at the same time try to realize that there is some force working and meeting some resistance (of course it will be related to some slight activation of muscles). Breath should flow freely, without unnecessary control. Movement of your body should not be too big. All the time keep balance. Remember that this is not just visualizing, but using images, mental hints in order to evoke some body reactions and sensations related to it. Then imagine that water stops pushing you. Stand still, feeling it the same way as in previously described exercises. After a moment start thinking that masses of water which are in front you, now are pushing your body backward, and masses of water behind you are as if trying to stop this movement. Stop again, and after a moment start thinking about water pushing your body forward, the same way, as when you started this exercise. When water is pushing you from behind, your whole body is leaning slightly forward. When water is pushing you from front, your body is moving back to straight, vertical position. You will repeat these action many times. But think also about next elements, which will be described below. When water is pushing your body from behind, and it is leaning slightly forward, at the same time your knees are straightening slightly. Your head is leading this movement upward and forward. You can imagine that there are springs between top of your head (or forehead) and heels of both feet, and that you are stretching these springs. You should feel resistance of the springs, but it shouldn't make you tense. And when water is pushing your body backward, you are as if sitting down, your knees bending slightly. Now you can imagine that there is some elastic stick, just below your buttocks, and you are sitting on it. It is bending, but at the same time creating some elastic resistance. This upward-downward force is important for creating the main forward and backward force. Imagine that there are many springs placed horizontally between your both legs, at various levels. When sitting down, you are stretching all those springs, when standing up you are compressing them. However this movement should be very slight, this is only supplemental direction of force. Remember about keeping feeling of comfort, without tension and stiffness. So, when water is pushing your body forward (you are meeting resistance of the masses of water in front of you), you are slightly leaning forward, at the same time slightly standing up (stretching springs between head and both heels) and there is also some idea of closing between both legs (as if slightly pressing springs between your legs). This way your body becomes more unified. There is summing up forces in all the main directions in three dimensional space. When water is pushing your body backward (you are meeting resistance of the masses of water behind you), you are slightly sitting down (feeling resistance of elastic stick), and slightly stretching the springs between your legs. When body is moving forward, there is also some very slight intention of turning legs inward, and when body is pushing backward, very slight intention of legs turning outward. This action should be related to sensation of meeting some resistance too. At beginning perceiving all those directions of forces simultaneously may not be easy. But don't worry too much about it, just keep practicing patiently, finding some pleasure in feeling things, and gradual deepening of ability of feeling it in your whole body at once. Don't think that there are so many elements. Talking about elements is only to make it more approachable at the very beginning stage. Actually all those elements should be seen as one thing, just natural parts of unity. Remember about keeping the feeling of relax and comfort. To help a beginning person to concentrate on torso and legs, arms actions were omitted in above description. So now lets talk about arms. When your body is leaning slightly forward and overcoming resistance of water (remember about stretching springs between head and heels, and about compressing springs between your legs), your hands are moving the board floating on surface of water forward - of course there should be feeling of overcoming some resistance. When body is pushing backward (overcoming resistance of water), you are slightly sitting down (on an elastic stick) and slightly stretching springs between your both legs, at the same time you are pulling the board back toward your body - again as if overcoming some resistance. When pushing the board forward, your body is slightly leaning forward. In result some pressing downward, as if trying to press the board under surface of water will become a natural action. You realize some resistance, when you are trying to do this. Imagine that there are also many springs placed horizontally between your both arms. When pushing forward, and slightly pressing down, at the same time there is some slight feeling of compressing the springs between your arms. Pushing forward is the main direction (you should have idea that this is the biggest force). Pressing down and inward are supplemental directions - these forces should be perceived as much smaller. When pulling the board closer to your body, from leaning forward position you are moving to vertical position. Forearms, which previously were pressing the board, now are as if trying to lift it. You can imagine that the board is tied to your forearms and at the same time is as if sticking to the surface of water, so you will feel that your action is meeting some resistance. This time you are stretching the springs between your both arms. Pulling back is the main direction, lifting and opening outward are supplementary directions, with idea of much smaller forces. Remember about coordinating all above described movements. They are starting at the same moment and stopping at the same moment. After finishing movement in one direction, stop for a moment, check if you are keeping the feeling of unity of your whole body, if in some part of body there is not too much tension or too much looseness (it would mean losing the feeling of unity and elastic relaxed strength). We talked here about some movements, but actually this kind of practice should not be about moving, but so called "seeking movement in non movement". Starting from description of movement was to make understanding the way of coordinating whole body and directions of forces easier. But now, doing the same exercise, try to limit range of the movements. Movement is starting, but the resistance is stopping it, so movement becomes very short. For example movement in main direction can be some 2-3 centimeters (about 1 inch) and in supplementary directions only 1 centimeter (1/3 of inch). Remember that imagining and feeling resistance should not cause losing the feeling of relax and comfort. Breath should flow freely, naturally. At beginning it will be better to imagine that the active forces and forces of resistance are extremely small, close to zero. After some time of practice you will be able to work with idea and feeling of bigger forces, and this will not cause wrong tension (stiffness), but that needs some longer time of diligent practice. Next stage will be making the movement still smaller, until it becomes actual „seeking movement in non movement". Non movement, static posture, will be a basis. You are trying to start movement in some direction (remember about supplemental directions too), but at this moment the resistance is stopping your movement. So there is only the starting point of movement, without continuing it. This is not just a static posture, but this is also not a typical movement. It is often described as relatively static exercise. There is no excessive tension (stiffness), but all muscles are slightly activated even before starting a try of "seeking movement". When you are trying to start the movement, there appears only slightly bigger tension, and after a moment you come back to starting situation. This is also not a typical isometric exercise, where you would work with very big static tension. Here change of tension is small. All muscles are active, whole body is working, all organs are stimulated by moderate effort, and at the same time you are staying relaxed both physically and mentally, with your mind focused and cleared of disturbing thoughts. Relax and tension are relative concepts. Seeking the balance between them is something dynamic. You are gradually coming closer and closer to the right state. Lack of the right kind of tension will mean losing the feeling of force, strength. But when tension appears, doesn't it cause stiffness? If stiffness appears, relax is needed. But doesn't this relax cause slackness, too much looseness, losing the feeling of force? This is balancing on the border between opposites. Thanks to making the form of movement extremely simple, working with situation of „almost no movement" or „one point of movement", it is possible to realize the most subtle elements and aspects of body working, achieving very deep level of mind and body coordination. This element of subtlety is also stressed in tai chi (t'ai chi ch'uan, taijiquan), where exercises are executed very slowly, to make it easier achieving this deep coordination - "unity of mind and body". But although movements are done slowly, this is still quite complex situation, where consciousness of a beginning person is "slipping over" big parts of movement, without deeper experiencing this coordination and without being aware what's happening at each point of the movement. Thanks to making situation even simpler, the zhan zhuang method enables better focusing on what is important, and hence faster authentic progress. 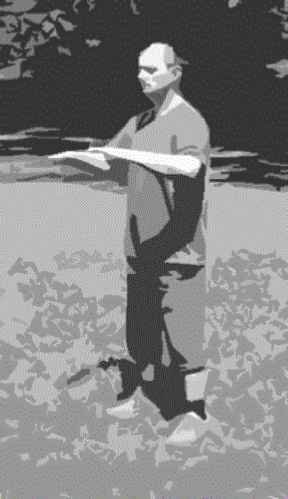 Zhan zhuang exercises are also used in schools of authentic tai chi (taijiquan). However in taijiquan those exercises are not so much stressed as in yiquan. Taijiquan (t'ai chi ch'uan or in short tai chi) is the most popular of so called internal martial arts. Although legends say that it was created many centuries ago, most evidence suggests that under such a name it appeared not earlier than in 19th century (but of course there had to exist similar precursory systems before). Taijiquan means fist of ultimate pole. Ultimate pole (taiji) is the primeval unity, which is born from formless wuji - without pole, and gives birth to yin and yang. The earliest meaning of the word taiji was: top of a roof - something which caused one side of the roof being exposed to sun (yang) and the other being in shadow (yin). The name taijiquan means that this martial art is based on concept of unity of contradictions - yin and yang supplementing each other. 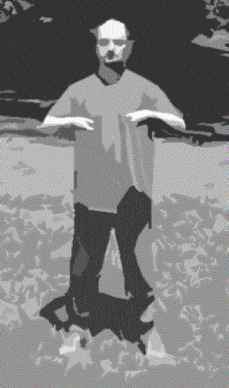 Taijiquan forms, which should help to develop combat skills, at the same time can be classified as qigong exercises. Thanks to the principle of "mind is leading qi, qi is leading body movement", which means that in practice each, even most subtle movement is following some mental image - intention, and is not done mechanically or automatically, taijiquan master can use his body with incredible precision. 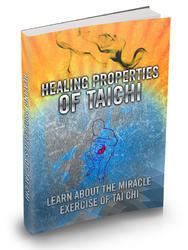 Presently for most people taijiquan (tai chi) seems to be just a kind of exercise for health. But it is still practiced as a martial art too. Most popular styles are Yang, Chen, Wu, Wu(Hao) and Sun. Lately some other similar systems, earlier known by other names, but now called taijiquan (to use marketing potential of this name) are becoming known. To most people Chen style taijiquan, with forms in which slow and fast movements are mixed, more than other taijiquan styles looks like a martial art. 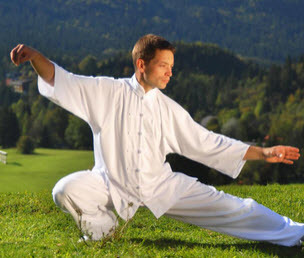 The most popular Yang style, where whole form in most cases is done slowly, is also practiced by many people as a martial art, but it evolved into many variants which are practiced only as health cultivating exercises. This is really interesting that many taijiquan practitioners find out that they can achieve more health benefits while learning from those instructors who teach complete systems, than from those who do only the health variant. This is probably result of the fact that to be able to teach taijiquan as a martial art competently, you need to learn all its aspects very well. So in such a case the quality of teaching will be higher, even if some student wants to learn only for health and not for self-defense. And in case of many instructors who are teaching tai chi for health, their knowledge of the system is too limited, which causes lower quality of teaching. In too many cases teaching only for health is only a convenient excuse for those who don't really know much. What is the strength of directing style?